Is golf your game? What could be better than walking out your backdoor and right onto the 18th hole, complete with everything you need to improve your putting skills? Backyard putting greens are a fantastic way of bringing together friends and family to enjoy the outdoors. 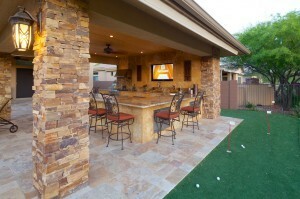 Many golfers find that working on their handicaps in the privacy of their own home takes strokes off their game—plus, when paired with an amazing outdoor kitchen and a fabulous pool that features a swim-up bar or tanning shelf, a putting green becomes part of the ideal secluded, all-inclusive recreational center. Make it challenging. A flat one-hole putting green gets boring fast. However, if you make it challenging, friends and family will enjoy the putting green for years to come. Putting greens are created with artificial turf, because mounds, sand pits, and interesting shapes can be hard to irrigate and mow effectively if you use living turfgrass. 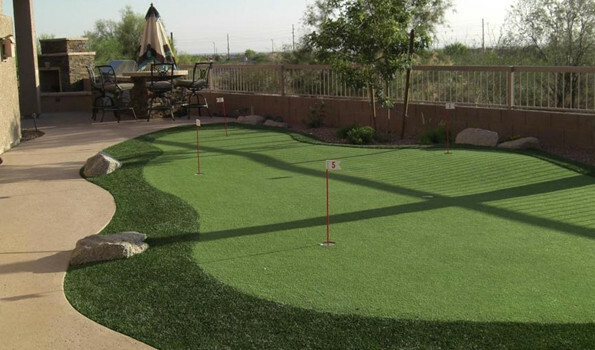 Artificial turf also has an even surface that’s ideal for putting. Synthetic greens are virtually maintenance free. They’re able to withstand hot or cold temperatures, as well as wet conditions, and are just about always ready for play. Unique Companies use only the best synthetic turf when designing customers’ practice areas. The fibers are able to simulate the appearance and play of a traditional grass course, while remaining free of color fade and weather damage – even when you play round after round in your quest to become the best putter you can possibly be. You won’t need to mow or water the green as you would a grass one: apart from removing shed leaves each fall, there is almost no maintenance required. Despite all this, we make sure your greens look and feel like a hole on a real golf course.